Our Maryland electrician continuing education courses are approved by the state to satisfy your continuing education requirements. All of our courses are also now approved with the Cecil County Board of Electrical Examiners. Take the continuing education to renew your MD electricians license today. All of our courses can be completed At Your Pace Online to help you meet the state's requirements to maintain your license. Once you finish your class you will have an official certificate of completion to save for your records. 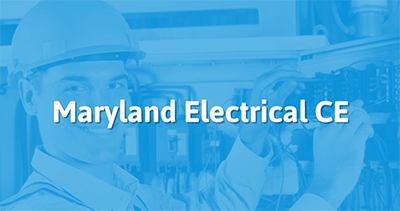 In the state of Maryland, electricians licensed at the state level must complete 10 hours of continuing education every two years. 5 hours are permitted to be online, but the other 5 hours must be in a classroom setting. Our Maryland electrician continuing education courses are approved by the state to satisfy your continuing education requirements. This course is designed to help you meet your continuing education requirements by covering changes made to Chapter 6 of the 2017 NEC. The course has been approved by the Maryland State Board of Master Electricians and will be reviewing code for special equipment. The following is the list of course(s) that have been approved by this Board to be used to fulfill the required 5 hours of continuing education credits for renewal of 2018 and 2019 Cecil County Electricians License. We are only accepting courses on the 2017 National Electrical Code and courses are only approved for the hours of continuing education credits as indicated. date of course, students complete name, number of CEU hours and sponsor (if applicable). We are a yearly license with an expiration date of April 30. If you have any questions regarding our continuing education requirements or need approval of additional courses or instructors, please do not hesitate to contact me by phone or email. If you have any questions regarding our continuing education requirements or need approval of other courses that you may be offering, please do not hesitate to contact me by phone or email. The State Board of Master Electricians (Board) has received your submission for Continuing Education Courses, which was reviewed. Upon review of all documentation submitted, the State Board of Master Electricians determined to APPROVE the code changes, course update, to your current Continuing Education Course.